Kent Lutheran’s 2018 Thanksgiving Offering will be given to our local Kent Food Bank this year. Located just a few blocks from us in downtown Kent, at 515 W. Harrison, the Kent Food Bank provides assistance to families and individuals living within the Kent School District. Services include food, clothing, and referrals to other agencies/resources for additional needs. Hours of operation are Tues., Wed., and Fri., from 10 am-1 pm, and the 2nd Wed. from 5 pm-6 pm additionally. 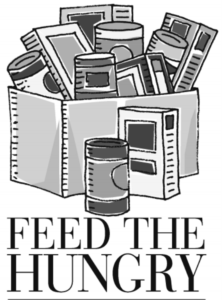 Donations of food and clothing can be made Tues.-Fri., from 9 am-2 pm. The Food Bank began in 1970 as a temporary agency to serve families during an economic recession. Over the years, it grew into a permanent agency, and was one of the founding agencies who helped to streamline access to human services for low income folks by locating providers in a single site. This site became known as the Alliance Center. In 2004, Kent Food Bank moved into the Alliance Center, where it remains today. Operating primarily as a volunteer agency, the Food Bank obtains a majority of its support and donations from the Kent community. 99 cents of every dollar donated goes directly to client services, and over a million pounds of food are distributed to some 70,000 people every year. It is a fact that in Washington state, 1 in 5 Washingtonians rely on local food banks. Being located in the downtown area, Kent Lutheran knows well some of the needs of our community. As you ponder your blessings this year, and give thanks for them, prayerfully consider what you might give back to our community, and this worthy cause. We are grateful for you, and for your generosity. Here are the top 10 needs of the Kent Food Bank: low sodium soup, low sodium canned vegetables, canned tomato products, canned fruit, canned proteins (Spam, tuna, chicken), ready-to-eat meals (chili, Chef Boyarde, stew), canned/bagged beans, toiletries, diapers and formula, stationery supplies, garbage bags. See above for days and times to donate items. They are also always in need of volunteers to work in the clothing bank, the office, the food bank, or to drive and deliver food to assisted living facilities. Volunteer applications can be found at the Kent Food Bank online site. Your donations of time and resources are always appreciated.